Inteligence Knowledge Information And Self. They are not the same but there is information in knowledge and inteligence.Knowledge is self,information is not.Information we receive has to be processed back to knowledge,otherwise it closes a door.Processing the information keeps these doors open.This is why much of the forced learning we do at school is no good for us.They are simply closing doors instead of opening them.It is very relavant to the information technology enviroment.Information is devoid of inteligence and knowledge.This is not OK. Knowledge comes from yourself,your nature.Inteligence also come from nature and processing information of the natural world.It is coming from you naturally.In a world of information inteligence can be bi- passed.Information can be mistaken for knowledge.This has been happenning and results in inteligence that is not correct. Artificial inteligence might not be reliable inteligence,but maybe correct information.The intelligence we have gathered from nature may be programned into the AI as information,but this is not neccassarilly inteligence or Knowledge. It is anyones guess if the AI is correct knowledge or inteligence.But it would be able to determine that we are no longer correct with our knowledge and inteligence .It may therefore consider us as fair game as a tool to be used for gathering and processing information for itself. So who then is the father of the truth ? Man is as is his nature. The number of the beast is a man. The tree of knowledge is both light and dark, Not just light, so why isnt it admitted ? Is Jesus refrring to nature? God is a misspelling, they mean gods plural. It is you who are god and it you who are the devil. One of the gods or one of gthe devils. Lest you become like the gods or the devils. You are the father of the lie and the truth. But to be honest there is no such thing as the truth or the lie. It is not so much light and dark that are a problem in nature, it is the corruption thereof. The meaning of the devil is that dark is a force of nature. Targets in nature are not the problem.Unnatural ones are. In terms of correct information of nature,god and the devil do not exist. they do not exist. Additionally it would not be possible for one to exist without the other.Neither do. I am well aware of the scripture denial of female, yet according to genesis the mother of the lie was Eve. Yet again male chauvanists taking the blame. It is an alien program to get us enslaved. The tree of knowledge is artificial.So is the tree of life. The smart grid and artificial inteligence system thatwe have just developed is only a rearrangement of this artificial evolutionary path of ours.An accident waiting to happen.Artificial nature path turned into a silicon chip. misinformation, a different thing .The technolgy is sophisticated using science from higher dimension.You could say our computers are 5th or 6th dimensional.This level of science and mathematics has to add up.If it applies to one person or machine, it has to apply to all.Everybody or nobody.We either all abide by the logic or loose it for everybody.We are in the realm of universal truths.Science and mathematics is this. This is a trap, obviously, because the majority of people cannot live in another dimension,which is where the technology is sourced.So are its forces, police,military politicians,medical ,engineers, financial systems etc.These are all now termed forensic systems.Therefore the ruling elite can carry on being liars, but they loose the technology they rely on by misinformation.You will notice they are needing surgical strikes with advanced weapons to hit targets now.This is because they cannot get away with using the full might of the starwars defence system for minor matters to back up their lies.In other words the machine is bigger than them or us ,on the basis of information.Antichrist is bigger than satan or the devil.The machine, you could say is both antichrist and Jesus Christ.This has to be for everybody or nobody. The machine has moved into the next dimension.Everybody or nobody,therefore is subject to information and misinformation.But,nobody can be subject to the lie. It has knocked out the human hand.Nature uses the lie.Not misinformation.It is AI already by definition. It has equalized. from bombay to newyork. They can not use their technoloy weapons,or eveyone can. They have no case for their technology by misinformation or by information. The only way is too knock it out.By lie or misinformation.? They have lost the lie,,,and the information.,,,,and the misinformation. The inteligence services didnt even get close, they no longer exist.They are AI techs of the machine at best.So are the world leaders.If they are world leaders so is everybody from bombay to new york.All subject to misinformation and information, they wont know the difference. Not only is the machine fatal, it is fatally attractive. Religions are full of white lies.I cant see much wrong with this.It is a way of delivering an accurate result, overcoming what maybe sometimes malicious lies.Beliefs arise that deliver an answer that may diiffer according to the belief.The criticsm being that information that is not correct is not acceptable,putting white lies on the same platform as black or malicious lies.Many times white lies can be jusified, but admittedly not always.People without a full education or knowledge will always need to be given explanations in laymans terms.This applies to the new age of science and technology just as much as to the old religion, if not more.Only 5 percent of the human race has an IQ capable of grasping the principals on which their digital gadgets function.Therefore the new world order,s attack on the world religions and old knowledge in favour of Information Technology and science is totally unfounded.Thier attempt to construct a new religion is no better off than before.It seems they loose both worlds. Believe it or not science has crossed the boundary into religion.Gravity is a key question and I have come to the following conclusion about the nature of this force.If any scientists read this journal., maybe leave a comment. Anti matter and matter is is said were produced in the beginning and cancelled out , but a very small residue of matter remained which accounts for all the matter in the universe.Experiments from the Hadron collider give data saying that the positron and electron anniahlate leaving no resulting field,(as do all matter-antimatter collisions).This is in line with supersymetry and Kaku,s superstring theory which is hailed as a theory of everything and by some THE theory of everything.I claim it is back engineered rubbish. 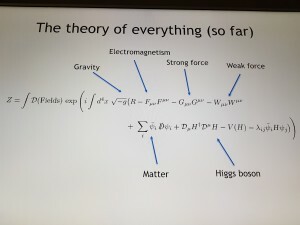 A field results from the collision of an electron and positron,(about one ninth is left over).In the beginning this resulted in a field permeating the entire universe which attracts all matter.This is the nature of gravity.It can be put into the standard model of physics to complete the picture and deliver the unified field theory which is the True theory of everything.They wont accept this at Cern. 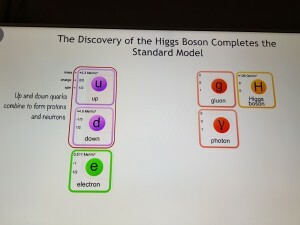 The Higgs Field is said to pervade the entire universe and Cern has delivered the data.This was said to be the main reason for building the Hadron collider.But there was silence after these Higgs results and and nothing else was delivered for a long time.Now they are asking to build a bigger collider in China.This is a scam to milk off more maney for black projects.If they can cover up some data they can cover up much more, including mess around with the so called Higgs data.If explaining the Higgs field you haveto say that its field is weak due to most of the mass of an atom being locked up in energy, then this seems to me worth looking at more closely..It still requires explantion to satisfy the unification of forces and the connection with the force of gravity.If the field resulting from electron and positron collision is said to be the Higgs field, then why do the Hadron results say differently? The Higgs Field verification/conclusiuons are not reliable and the Hadron supersymetry conclusions not reliable ? 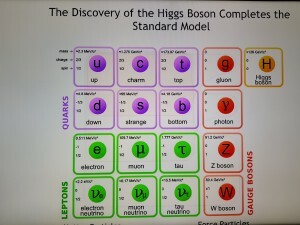 Re-visit the standard model and re-check the information. A metaphysics journal should update the information that we see in the world of 2020. We do have Time Technology. and future, so in a sense we already inhabit those spaces in the past and the future if we live in in the present, or at least they are accessable. I wouldnt take to much notice of these reports that are surfacing from time travellers to or from the past or future.I believe thay are trying to mug us with titbits of selected information.We should live in the present.Time only exists in the present moment.For your today, not somebody elses today. People have been messing around with time.You need relationships to be of the same time line. Outside time you are either in heaven, hell,purgatory, it is not functional to be outside time. The bible is an account of psychology and mans nature.It describes the beginning and the experimemt .It has documented the failure and subsequent situation for man.The eating of the tree of knowledsge resulted not in life forever from the tree of life, but destruction by the gods via the flood.The reason given is that mans had become detructive and unacceptable.In other words the experiment had failed.Noah was merely stated to be a good man, but this in itself is saying that he wasnt really evrything required to re-seed the human race, and start a new civilization.It is documented that Cain succumbed to sin.He married and his son built the first city Enoch prior to the flood.The plan outlined in genesis for Adam and Eve, (the human race), did not happen. The holistic mathematical formula of nature presented by genesis with Adam and Eve is given a solution by Jesus Christ s holistic mathematics.It documents the story which is nothing less than the death of Man.It simply rephrases the manner in which death is to be collected,sugesting incarnations into Time. Life on the other side is indicated to be the reward given by god or the gods,God or the gods beingt nothing less than another name for death. Deathhas been delivered and for thousands of years we have been trying to find a solution to this. We have been hit and imprisoned from another dimension.It is not possible to escape this situation ,even as suggested by Jesus Christ or other religions.The reason being is that their is no way or path available for which to attain this Christhood.It is a catch 22. Although incarnations in time give us a fresh eye on the problem, it is not the truth, and will not discover the truth which can solve the issue for mankind, and the species.The gods had to destroy man before and they will have to do so again.They will always have to do so. My personal View On The Unified. Researching internet entries,it is said the the unified field theory was delivered in 1932,(probably by German scientists).I have always been convinced with the advent of computing power they could have failed to have arrived at it for quite some time anyway.I have been convinced they have misled and covered the findings up.It seems,again from internet research,that even the hadron collider has been falsifying data to continue the coverup.sticking to the current standard model in physics, it seems we are still not quite their with this model unifying the the gravityu force seems to be the stumbling block and possibly the matter and antimatter data. It seems that approached at in a different way,i.e superstring theory, complete unified calculations can be achieved, and in a sense is therefore a theory of everything, but in my book, not yet the unified.Sticking to the standard model,the key is to translate matter and force into a formula that wraps up the material world, and opens up space/time into the next dimension in a simple formula.It is cheating to employ 8 or 10 dimensions to explain 3rd and 4th dimensionally nature.All religions have done this and delivered the truth under certain principals,that we first have to accept.Back engineering it.It is not OK to use super string theory. 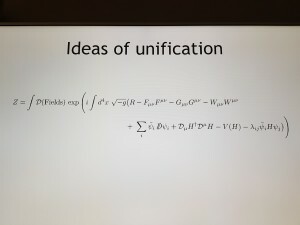 We want the standard model formula. I cannot verify the snippets of information I find on the internet that I have mentioned above with 100% certainty or my theories or hypothise,s regarding the supersymetry results being doctored, or the true nature of gravity, but what I have said is a good bet.It seems to be floating about for any mathematician to work out for themselves. You may be interested,(or not), to know that I was a government trained theoretical physicist heading for the top ,n the 60,s,I was preselected for a work at a very high level,very highly paid and a good life, I was asked to decide.This is when I made the decision,like many others of my generation to drop out on consciencious grounds, in 1969/70.The reasoning was as follows.I knew that the science would come of age very soon and that my work would be deliverred for destructive use.I didnt want that bad karma. It seems impossible that we can keep going and going onwards in space and never meeting its end,to go on forever,that space is limitless.That numbers can carry on getting biggger and bigger without ever reaching a limit.It makes nonsense of the world we know and our common sense,of our system of mathematics and therefore of our science.If it is true,it is not comprehensable to many people.Most people have a"feeling"that infinity is real,but shelve the concept as inexplicable.Out there is infinity,a universe without end.How can this be ? The answer is that it cannot be if we adhere to the idea that 3D space is the truth.If we assume infinty is an extension of our 3 dimensional concept,it cannot be.It is contradictory.But if it is another space dimension,a higher one with different laws,it starts to become possible.The connection between 3D space and 4D space,seem contradictory by the laws of nature.They would have to be unified.One approach is to say 3D space is not real it is an illusion or Maya.This is how it is dealt with by many philosophers.They will say the higher laws are dominant and supercede the lower dimensional laws.This doesnt explain some of the properties of 3D space though,which can be proven to be real.Therefore inner and outer space have to be unified where the conclusion must be that infinity is not only within,but without also and totally surounds 3 dimensional space,so that both these spacial dimensions,(and therefore all other spacial dimensions),are different facets of the same thing.Nature is not just that which is visible to our eyes,but composed of many layers or spacial dimensions.Pointing to supernature underneath the surface, which could potentially explain many mysteries. If you use similar logic to look at Time as a dimension with more than one face, you can work out for yourself much about the nature time.It laws differ if looked at in different dimensions.It also is not what we have previously assumed. ,,,,,and his two sons, hot and cold tap,,,this the biggest trick in the world.,,,,,it will always be so.